I just got back from the Seven Sister’s Quilt Show in San Luis Obispo, California and was worn out and didn’t have a lot of time for this weeks piece. But, that just goes to show how quick, easy and satisfying these little Twilts can be. 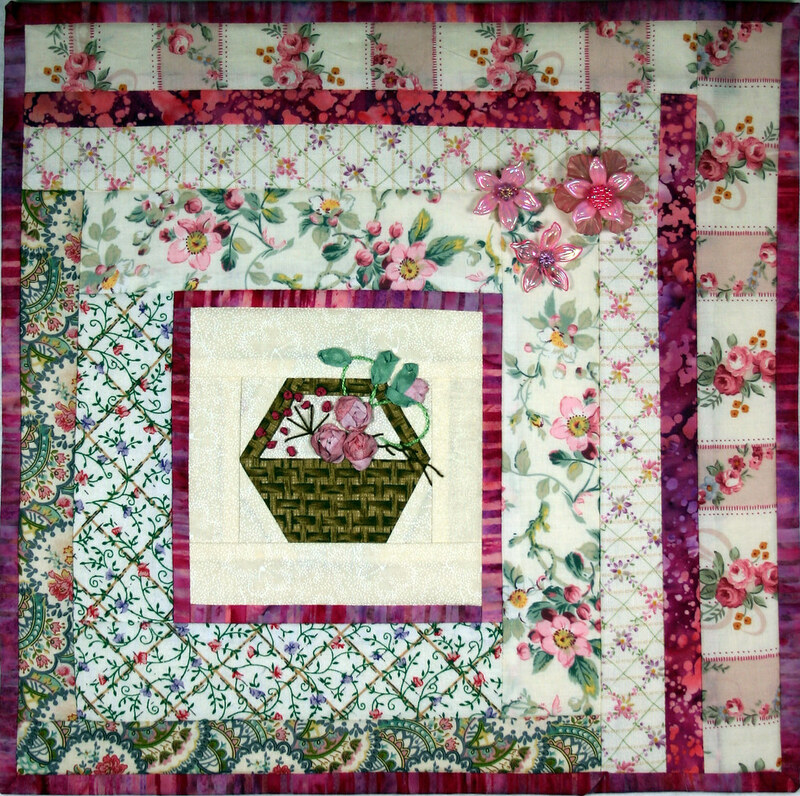 I started with a embroidered paper pieced basket block from my unfinished project stash. This was a left over piece from a couple of little wall hangings I made at least 15 years ago. It was too pretty to waste. I sewed the lot cabin strips on through the batting and back as I worked my way out to the outer edges. There are several Liberty of London type cotton lawn. These are very soft, light weight fabrics with wonderful prints. The added flowers are plastic molded flowers from Australia that have just been waiting for an opportunity to shine. I was quite satisfied with this project. I would love to see your Twilts. Drop me a line and I will be happy to link to your Blog or send me a picture and I will feature it here. For more about Twilts see Twitter Quilts….Twilts. 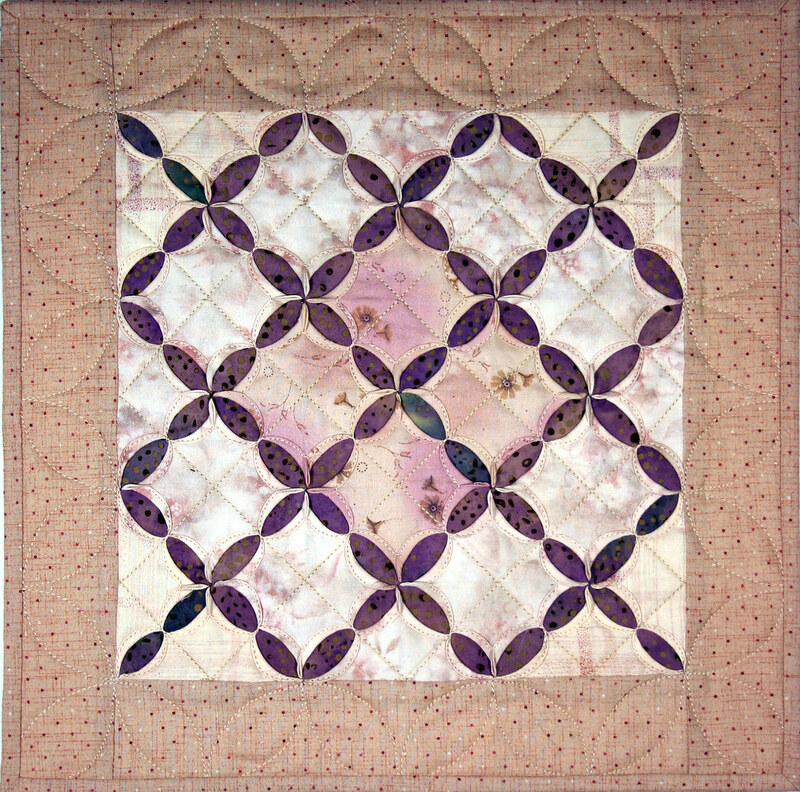 The Bloggers Quilt Festival Spring 2009 is still going on so please visit Amy’s site and the over 400 entries and my entry, Memories & Merlot, as well. It was over 90 degrees here yesterday and is supposed to be again today. Then it should cool down to normal spring temperatures again. That was enough to remind me that Summer is just around the corner. 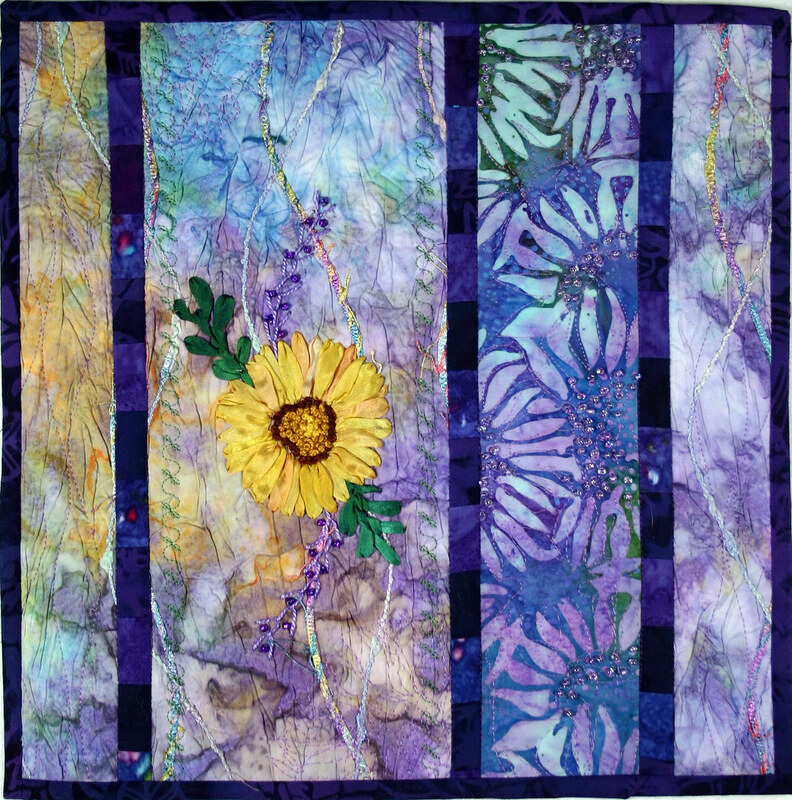 “Just a Hint of Summer” features an embroidered Sunflower of hand dyed silk ribbon, pearl cotton and beads on crinkled batik fabric with lots french knots in the Sunflower center. 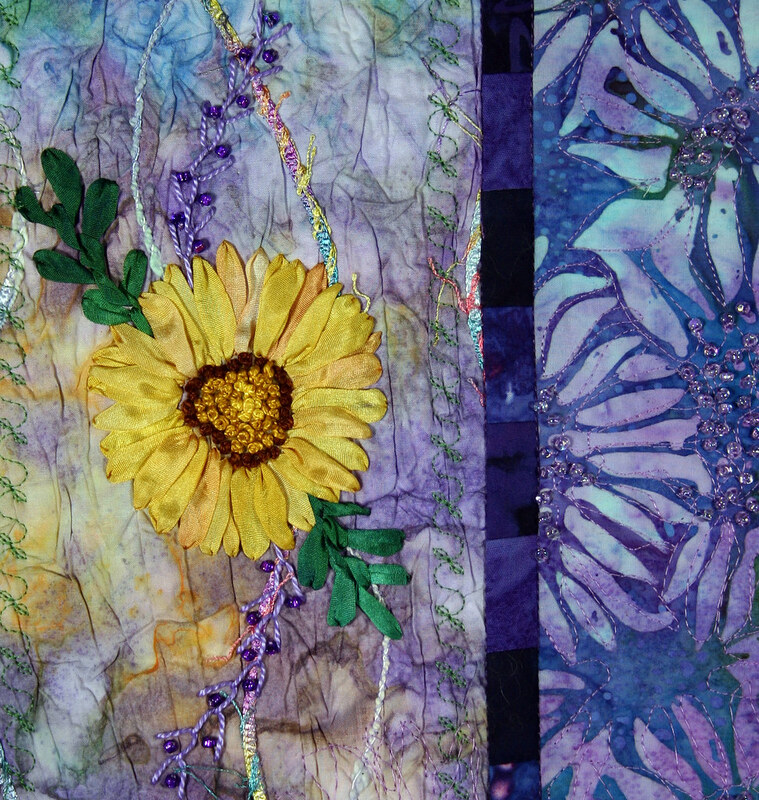 The sunflower batik has beads added and the purple insets are pieced of multiple purple batiks. I hope that you have been working on a Twilt or two. These little pieces have really sparked my creativity in so many unrelated ways. Amy at Park City Girl came up with this fabulous idea to do a Blogger’s Quilt Festival. I read about it and wholeheartedly decided, I’m in! “Memories & Merlot”, 56″ x 64″, is a variation of my Cathedral Window Technique. The center features single 3D squares I filled in the edges of the center and the border with 3D triangles and felt that really gave the quilt it’s Cathedral Window feel. 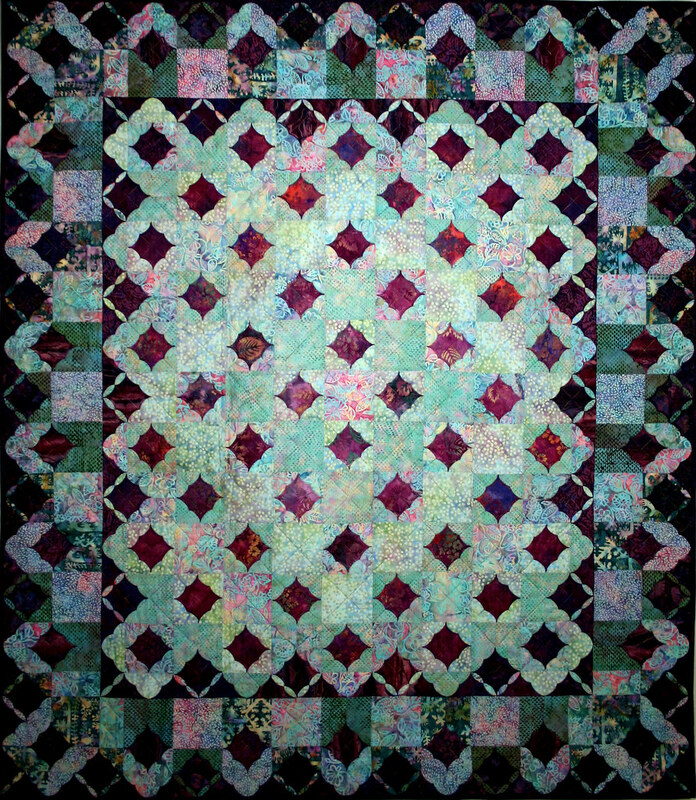 The quilt was stitched in a grid and the bias folds of the 3D squares and triangles were rolled and stitched at the quilting stage. It took me a while to finish, being one of those projects that I would set aside when other more pressing projects came along. Life got in the way as well, three moves in two years. Lots of memories of those times. The fabrics are all yummy batiks, different prints in the same color ranges and it does gradiate lighter in the center to darker at the outer edges. It took me ages to come up with a name. The Redish colors always made me think of wine and I do like my wine…..oops, did I say that out loud? Shiraz is my favorite but a good Merlot is very acceptable. Click on the pictures and it will take you to high resolution ones on Flickr. Maximize the browser and you will get a larger picture. 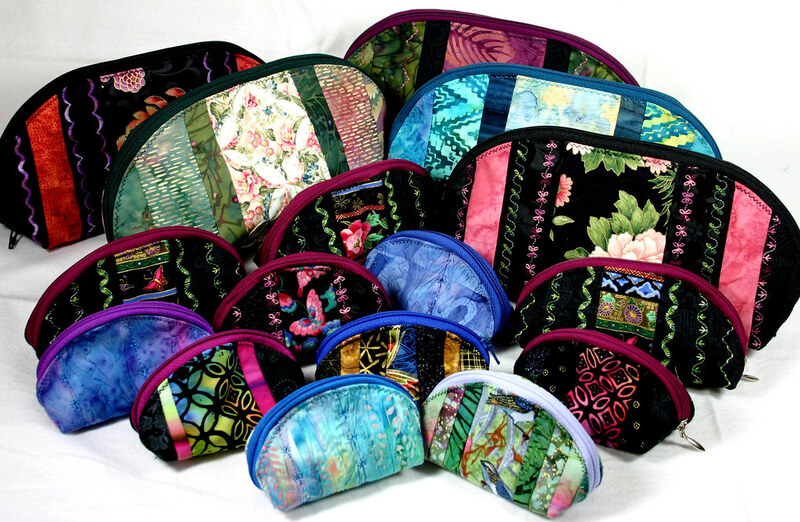 I have been making these little bags for years and have been promising a pattern for about that long. I have a presentation/demo tomorrow on how to make them so I figured I might as well finish the pattern and it will be available soon. The smallest bags are no bigger than a coin purse and are just so darn cute. They are sewn completely by machine. I could use a better name. Any suggestions? As of 4/18: I have finished up the pattern. It includes 3 sizes and costs $8.00 plus $1.00 postage or as an e-pattern for $6.00. Please email me if you would like one. I do accept PayPal. I did something a little different with this week’s Twilt. I kept eyeing this older Asian print that probably was produced in Japan when they first started printing fabrics for the quilters. The funky colors and old fashioned designs were calling to me. What can I say, I just let go and took a larger square of the fabric, sandwiched it and started quilting. 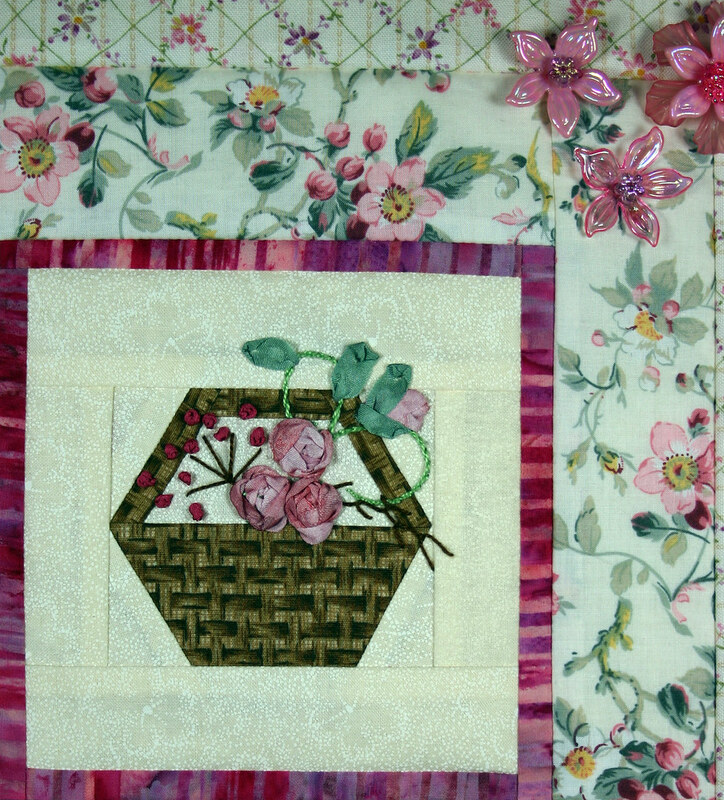 I used regular stitching in black on the strippy areas and free motion on the flowers. I am not a particularly good free motion quilter so this was practice as well. I tried out a new product that I picked up a while back by Sew Slip. It’s a fairly large smooth sheet that temporarily sticks to the table and has a hole where the needle goes. I really will use it again. I feel like it helped. 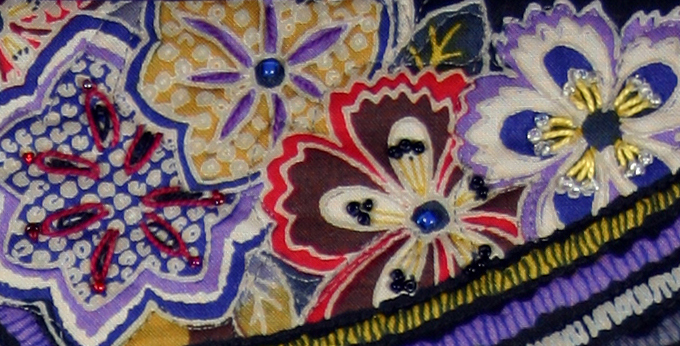 Once I finished the quilting, I bound the piece and then started embroidering and beading. I haven’t done that in a long time and I forgot how much I miss the hand embroidery. I used french knots in the centers of the big flowers, feather stitch on the leaves, chain stitch around those round things and straight stitch, lazy daisies and beads on the smaller flowers. I got ‘Lost in an Asian Garden’. Have you made a Twilt yet? They’re a great opportunity to practice a technique, use a small sample from that class you took and never finished, revisit a technique you have missed or you add to the list. 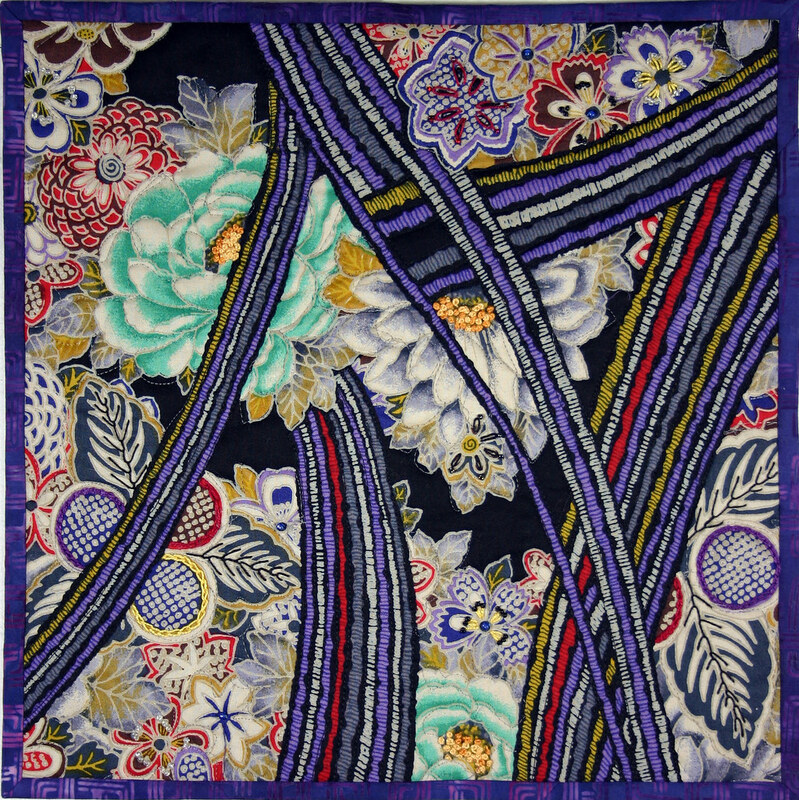 For more about Twilts: Twitter Quilts….Twilts. Last year Ria D’ Inca of Ventura made this quilt from my pattern Parchment & Black Lacquer and it won a First Place ribbon at the 2008 Ventura County fair. What a great job Ria did! If you see a quilt from one of my designs or make one of your own, I would love to post them here on my Blog. Thanks to Phyllis Curlee for finding this quilt and sending me the pictures. Cathedral Window Quilts are supposed to be my specialty so I thought it appropriate to do a Cathedral Window Twilt. 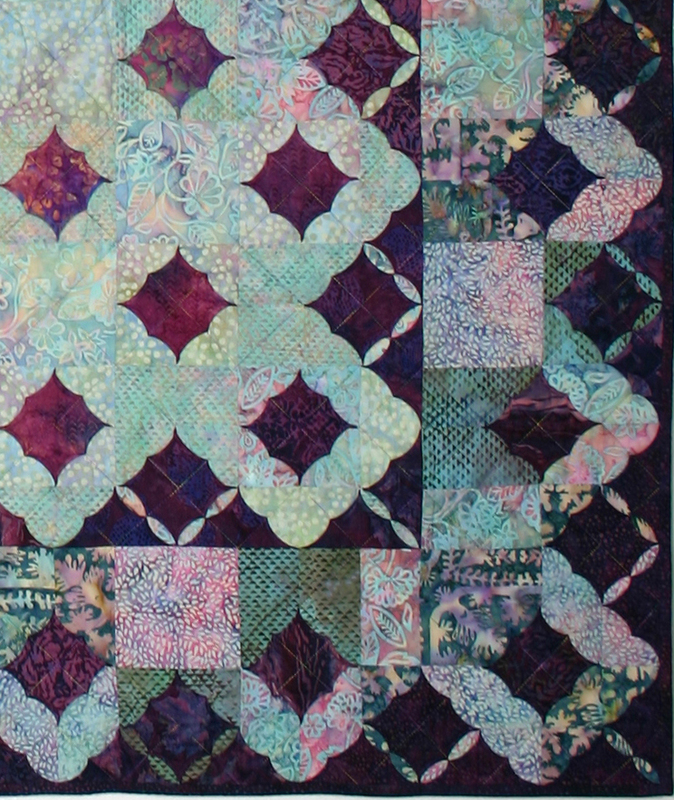 It uses the same quilted finish as Layers of Lavender and really did only take a day to complete. The subtle fabrics I found really give this piece “That Old Fashioned Feeling”. I gave in and now am on Twitter for those who would like to follow me there. http://twitter.com/SSwanland For more about Twilts see Twitter Quilts….Twilts. The picture on the left shows the frames pieced pre-border. The picture on the right shows the piece partially quilted. On Saturday I collected my friend Carol and we headed to the Brooks Institute Ventura Campus and the ‘Svara’ Multimedia Documentary Project Presentation of South India. My daughter Sybill is one of the students and spent seven weeks in South India with 19 other students which she cronicles in her Blog. We viewed a film, a print exhibit and vignettes portraying life in India. It was wonderful. The group created a book and DVD with wonderful pictures and stories of this unique part of the world. I also got to see my two grandsons and their friends. Kelby is far right and Kyler is in the center in Black. It was fun and informative. The group is selling DVD’s and Books if you are interested. I just finished photographing this table runner for a class I am teaching at The Fabric Patch and thought I would share it here. It’s based on my pattern Butterflies but a better size for a class. It uses the rolled bias folds of 3D Triangles to form the curves. Tuesdays Twilt uses the same basic block but much smaller.